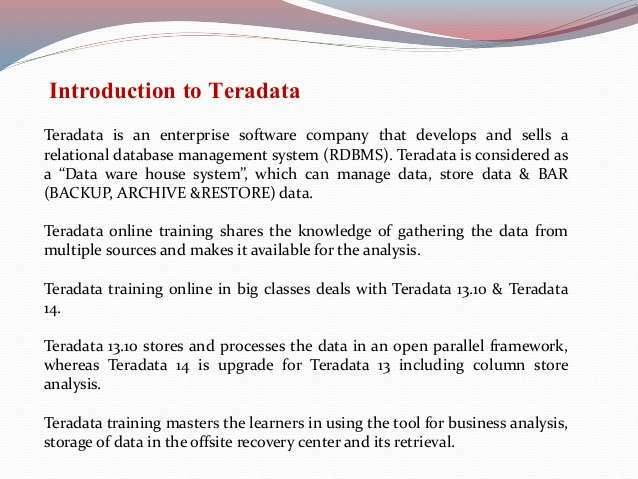 Teradata is an enterprise software company that develops and sells a relational database management system (RDBMS) with the same name. 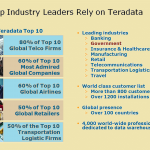 In February 2011, Gartner ranked Teradata as one of the leading companies in data warehousing and enterprise analytics. Teradata was a division of the NCR Corporation, which acquired Teradata on February 28, 1991. Teradata’s revenues in 2005 were almost $1.5 billion with an operating margin of 21%. On January 8, 2007, NCR announced that it would spin-off Teradata as an independently traded company, and this spin-off was completed October 1 of the same year, with Teradata trading under the NYSE stock symbol TDC. 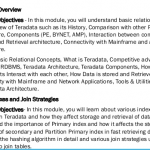 To Learn Teradata Click Here! 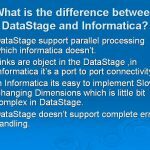 The Teradata product is referred to as a “data warehouse system” and stores and manages data. The data warehouses use a “shared nothing architecture,” which means that each server node has its own memory and processing power. Adding more servers and nodes increases the amount of data that can be stored. The database software sits on top of the servers and spreads the workload among them. Teradata sells applications and software to process different types of data. In 2010, Teradata added text analytics to track unstructured data, such as word processor documents, and semi-structured data, such as spreadsheets. Next: What is SAP Business Objects Data Services?